Have you struggled to learn Photoshop? Or perhaps you have grasped the basics but need more help advancing your knowledge. I'm here to help you. I am a full-time Photoshop Educator, and have been for more than 25 years. I've taught Photoshop to many thousands of people, from beginners to advanced users - and I can help you too! Become a member of my online training site and get unlimited, any time access to hundreds of hours of content! You'll get access to video tutorials, mini-classes and full-length courses, with new content added every week! Send in your questions and I will answer as many as I can in the form of a video tutorial. And you'll get exclusive access to the live Office Hours twice a month where you can get your question answered LIVE! 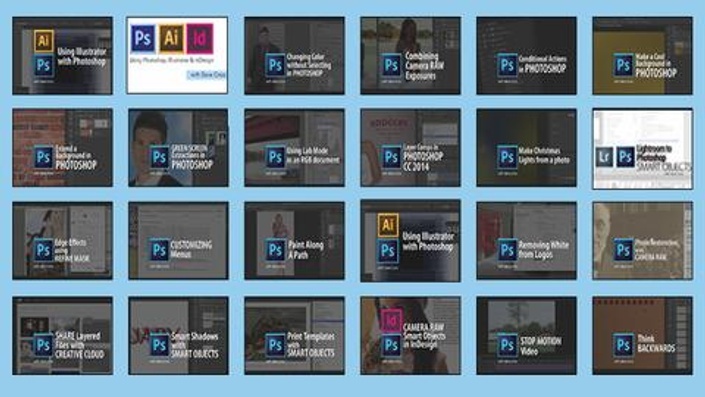 Whether you are a beginner or an experienced Photoshop user, you'll find videos that can help you take your knowledge to the next level. The All Access Membership is only $19/month or $189 annually - with the option to cancel at any time. You won't learn how to make an exploding planet. My training is practical with real-world techniques you can use every day. "I have been a member of Dave Cross workshops pretty much since its inception and as a person who has to use Photoshop on a daily basis, it is like having my own private guru that I can ask questions of at any time. Either I can scroll through the classes and tutorials or I can just wait until Wednesday and tune in for his “Office Hours,” which I try to do every week. I have used other Photoshop education sites over the same time but there is one big difference and that is Dave himself. Pretty much everyone can show you how to do something but Dave is an excellent teacher. He not only educates you but does it in a way that makes you smile. Highly personable and entertaining, I have never been bored or disinterested when Dave is teaching." "If you're fortunate to learn Adobe's applications from Dave Cross, you'll find that he has an abundance of useful, applicable knowledge and a very approachable style. Dave isn't just a great instructor and speaker, he's a genuinely good guy too." "I started subscribing to these workshops a few months ago. This is an amazing value. If there are any Photoshop users out there, I can verify that these are high quality lessons with a great deal of information to help with my photos and newsletter. Since I'm not the smartest guy around, I can repeat the lessons when I need to review. I remember at first thinking, "I don't need to spend my money on this. I can live without it." Yeah, but this is the most fun I've had while learning. This is from a 66 year old retired teacher"